Are you running to find your "sole" mate? Will you run on Valentine's Day? The slower 1/2 of @TwinsRun has her laces crossed that she will run into Mr. Right this Thursday, February 14 at the 3rd Annual Philadelphia Runner Valentine's Day Singles Fun Run. Last year, Malinda ran in her pink Team Sparkle skirt which matched perfectly with the Brooks Running tech shirt that was included in the registration fee! After running through the streets of Philadelphia, she enjoyed socializing with single "runnerds" at Ladder 15 Restaurant .Unfortunately, the spots for women are sold out. There are spots open for men, so any single male runner(s) should sign-up before it sells out! 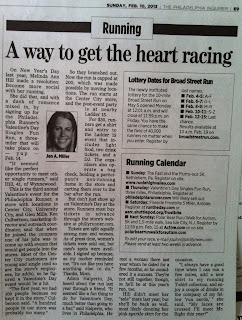 Read more about the Philadelphia Runner Valentine Singles Run in Sunday's Philadelphia Inquirer. Malinda was quoted in the story! On New Year's Day last year, Melinda Ann Hill made a resolution: Become more social with her running. She did that, and with a dash of romance mixed in, by signing up for the Philadelphia Runner's Valentine's Day Singles Fun Run, a three-miler that will take place on - yup - Feb. 14. 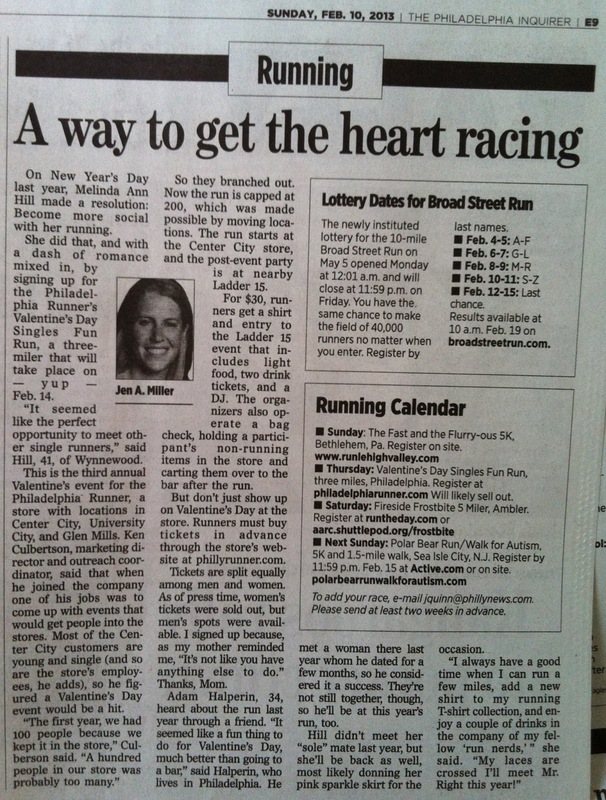 "It seemed like the perfect opportunity to meet other single runners," said Hill, 41, of Wynnewood. This is the third annual Valentine's event for the Philadelphia Runner, a store with locations in Center City, University City, and Glen Mills. Ken Culbertson, marketing director and outreach coordinator, said that when he joined the company one of his jobs was to come up with events that would get people into the stores. Most of the Center City customers are young and single (and so are the store's employees, he adds), so he figured a Valentine's Day event would be a hit. "The first year, we had 100 people because we kept it in the store," Culberson said. "A hundred people in our store was probably too many." So they branched out. Now the run is capped at 200, which was made possible by moving locations. The run starts at the Center City store, and the post-event party is at nearby Ladder 15. For $30, runners get a shirt and entry to the Ladder 15 event that includes light food, two drink tickets, and a DJ. The organizers also operate a bag check, holding a participant's non-running items in the store and carting them over to the bar after the run. But don't just show up on Valentine's Day at the store. Runners must buy tickets in advance through the store's website at phillyrunner.com. Tickets are split equally among men and women. As of press time, women's tickets were sold out, but men's spots were available. I signed up because, as my mother reminded me, "It's not like you have anything else to do." Thanks, Mom. Adam Halperin, 34, heard about the run last year through a friend. "It seemed like a fun thing to do for Valentine's Day, much better than going to a bar," said Halperin, who lives in Philadelphia. He met a woman there last year whom he dated for a few months, so he considered it a success. They're not still together, though, so he'll be at this year's run, too. Hill didn't meet her "sole" mate last year, but she'll be back as well, most likely donning her pink sparkle skirt for the occasion. "I always have a good time when I can run a few miles, add a new shirt to my running T-shirt collection, and enjoy a couple of drinks in the company of my fellow 'run nerds,' " she said. "My laces are crossed I'll meet Mr. Right this year!"